RAPID CITY, S.D., March 28, 2019–In conjunction with the American Civil Liberties Union (ACLU) and the ACLU of South Dakota, four organizations and two individuals have filed suit against the State of South Dakota challenging a package of state laws that violate the First and Fourteenth Amendments to the Constitution. Senate Bill (SB) 189 and SB 190 together function to chill free speech while paving the way for the Keystone XL pipeline, a TransCanada oil project. The set of laws also fail to adequately describe what speech or conduct could subject protesters and organizations to civil and criminal penalties. Known as the “Riot Boosting Act,” SB 189, with the use of broad language, says that anyone that contributes to a protest, whether through monetary donations, donations of supplies, or even through organizing a page on social media, can be held liable, and have civil and criminal penalties for supporting a protest that the state deems “violent.” Individuals or organizations that support a protest don’t even need to be on the ground or physically present at the protest to be held liable. Also under the law, TransCanada could take the money seized from protesters and organizations, and put that money toward pipeline construction. 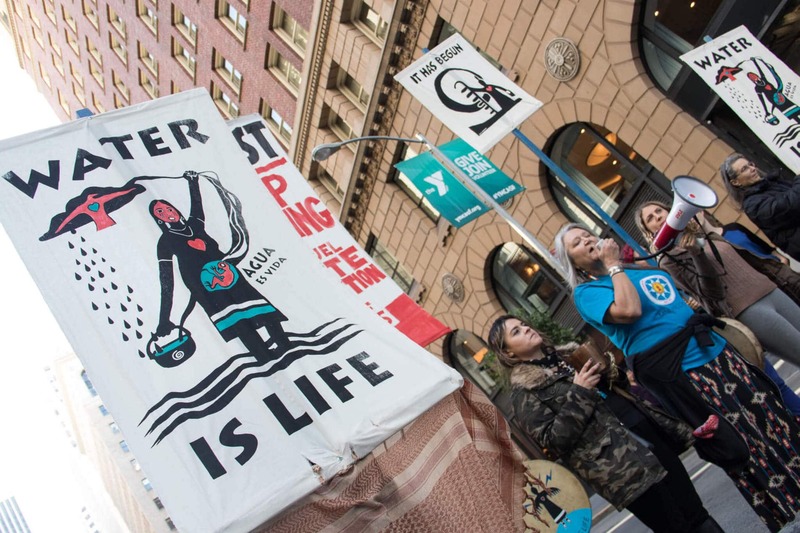 Plaintiffs on the lawsuit include four organizations– the NDN Collective, the Indigenous Environmental Network, the Sierra Club, Dakota Rural Action– and two individuals, Dallas Goldtooth of the Indigenous Environmental Network, and Nick Tilsen, President and CEO of the NDN Collective. While construction of the Keystone XL pipeline is currently on hold, following a Ninth Circuit Court of Appeals decision that rejected TransCanada’s appeal to overturn a decision made last year to stop pre-construction of the pipeline, the fight against Big Oil continues. The movement for clean air, land and water has characterized the past several years of Indigenous resistance in the U.S. and Canada. With evidence of climate change disasters cropping up across the U.S., from the fires in the western states, to the devastating floods across the Great Plains and the warming of our oceans throughout the world, taking a stand against the fossil fuel industry is critical, now perhaps more than ever. And our First Amendment rights are foundational to taking the stands necessary to make our world a better place for future generations.